The event itself is being put on by the Brazilian-American Chamber of Commerce, which has used the museum as a venue for past person of the year galas. Buying out a table at the event ran $30,000 this year, and according to the group’s website, it offers a chance to for members of the “international business, financial, and diplomatic communities” to hob knob. The event honors one American and one Brazilian “who have been particularly instrumental in forging closer ties between the two nations” according to the group’s website. Oddly enough, the group honored Michael Bloomberg, an outspoken climate advocate, last year. But this year’s event is a complete 180. 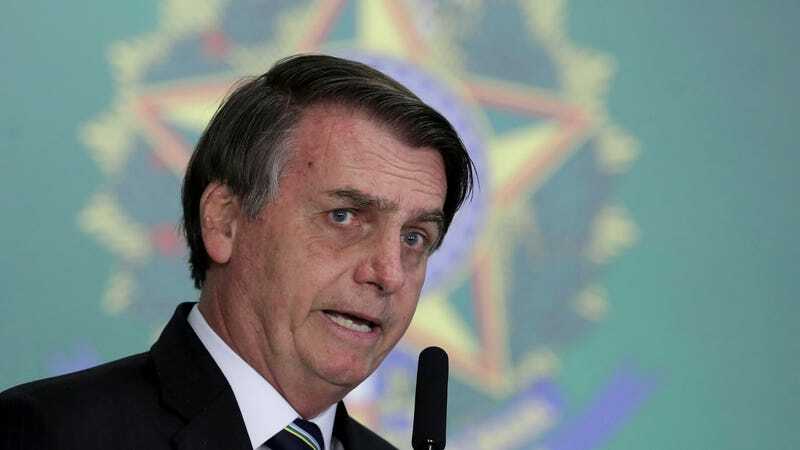 While the American honoree has yet to be named, the group selected Brazil’s new president as the Brazilian honoree dating back to at least February when the priciest tables for the event sold out. Costa first noticed the news the chamber would honor Bolsonaro nearly two weeks ago. He said he choked seeing that the museum would host an event, paid for by an outside group, honoring him. Other scientists also took note, including of the full page ad in the Financial Times last week announcing the award. Its board recently included Rebecca Mercer, while David Koch was a trustee at one point. Both are billionaires who have funded climate denying politicians and outlets. Koch, of course, also made his billions in part in fossil fuels, and an exhibit at AMNH in the dinosaur wing with his name on it came under fire last year for downplaying the role carbon pollution has played in changing the climate. And, of course, much of AMNH’s cultural collection sits on a colonial pedestal, having been brought to New York with little regard for the indigenous groups whose history was collected and cataloged. Update April 15, 5:00 p.m.: Welp, the event has been moved.